The singer whose voice has already conquered the whole world Josh Groban never ceases to surprise the audiences with his masterpieces of a genre balancing between classical and pop music. As the artist states himself he has never pretended to be considered an opera singer, although there are a number of classical opera pieces in his repertoire. This year Josh has been ahead of time giving us his Christmas record Noel which is sure to become classic by Christmas time and the songs from it will be played both in offices and at home celebrations. One of the main advantages of Noel is the grandiosity of sounding the songs' instrumental background for Josh Groban performs classical songs with the accompaniment of London Philharmonic Orchestra and also sings together with the African Children's Choir, a gospel choir and The Mormon Tabernacle Choir. Besides as always the artist has made several collaborations with such celebrities as Faith Hill and Brian McKnight. It is but natural that Josh Groban's vocals are still brilliant and the Christmas collection is sure to attract even more fans to him. The songs selected for the record have passed the test of time and are loved by anyone for whom Christmas means an event, and performed by such an unrivalled vocalist as Josh Groban they sound with a new force. The album opens with a remarkable performance of famous Christmas song Silent Night sung by Groban and a boys' choir, whereas on Little Drummer Boy guitarist Andy McKee joins Josh to make a brilliant and soft composition. Song I'll Be Home For Christmas written back in 1943 and devoted to the soldiers that have been far away from their homes has proved to be topical today as well. Scared composition Ave Maria does credit to Groban as a professional, the Children's Choir combines greatly with his amazing vocals here. Angels We Have Heard On High, a duet with R&B singer Brian McKnight pleases with richness of voices of both performers, and Thankful accompanied by piano is an example of Groban's most emotional singing. Guitars on The Christmas Song create a beautiful background for the singer's amazing vocals, and The First Noel (Duet With Faith Hill), is a beautiful and magnificent ballad and one of the most vivid tracks here. It Came Upon A Midnight Clear is performed with he only accompaniment of piano, and Josh's vocals are simply flawless here. On Panis Angelicus Groban gets the closest to the opera singing, and the final song O Come All Ye Faithful (With The Mormon Tabernacle Choir) is a great ending to the excellent album. Josh Groban's talent is known to the whole world, and whatever he sings becomes a masterpiece. Christmas songs are not an exception. The singer's new work's producer is again David Foster whose arrangements are not too obtrusive letting the young star's vocals shine in all its beauty. It is hardly possible to count how many Christmas collections there have been released since the holiday is celebrated, but it is only the chosen that manage to create a record that would be appreciated by the majority of listeners. Christmas is associated with family values, with the deepest and strongest emotions, and these days one wants to listen to the most soulful music. Probably these were the thoughts Josh had when approaching the recording of his creation, otherwise Noel would not have resulted into such an exciting and touching work. 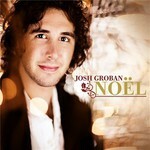 It can be undoubtedly considered the best Christmas collection to date and Josh Groban's another piece of art. Sincere and smoothing Noel is sure to please us each year for it is going to be an undertaking to outshine this gorgeous and truly gifted vocalist who has shown everybody what real season music should be like.